Largemouth bass. 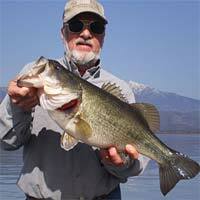 Of all the popular bass pursued by anglers in the US, the largemouth gets the most activity. It is distributed across all but a few states and adapts to a wide variety of water depths, temperatures and clarity. Largemouth bass can eat virtually any sport fish or baitfish available. Sunfish are a favorite and are at risk when they are one third (or less) the size of the bass. Largemouths are great fighters and can be caught by anglers of varied experience. Feeding sprees are short, but happen up to four times in a 24-hour period. Bass can also be enticed to strike baits for reasons other than hunger. Protecting their turf is the primary reason they strike during non-feeding times. This natural inclination to protect their territory is accentuated during the spawn, and particularly in nesting areas. Largemouth tend to spawn in shallower water that their cousin, the smallmouth bass. Understanding the migration of bass over the seasons can send us in the right direction as we begin our search every day we spend on the lake. Top Baits: Spinnerbaits, crankbaits, jerkbaits and soft plastics. Fish shallow to moderate depths as the bass move into spawning coves and flats in search of food, seeking warmer water, and preparing for the spawn. Try shallow-water flippin on cloudy days or in murky water. Top Baits: Top water lures, crankbaits, Jigs and plastic worms. Fish shallow in the mornings and evenings and move deeper as the sun rises. "Deep" depends on the overall depth of the lake you are fishing. In some lakes you may need to go as deep as 60 feet while others seldom hold fish below 25 feet. Largemouth's often feed heavily at night during the hot summer months. Fish shallow to moderate depths in the mornings and evenings. As the bass move deeper during the day move to outside deep structure and use spoons or jigs. Key on schools of bait as the bass will be nearby the food source. Top Baits: Jigs, pork baits and soft plastics. Try shallow in the mornings then move deeper as the sun rises. Bass are not very active in cold water, so move your bait in a slow, easy to catch manner and fish deep cover and structure. "Deep" depends on the overall depth of the lake you are fishing. In some lakes you may need to go as deep as 60 feet while others seldom hold fish below 35 feet. Largemouth bass have daily migrations from feeding areas to deeper holding areas. Figuring out the timing of this movement is a key to increasing your daily catch. While bass can be caught from shore, the odds of higher success are increased when fishing from a boat. Bass boats with trolling motors, live wells and fish finders are the ideal watercraft. Other boats like jon boats, pontoon boats and family boats can also be used for bass fishing adventures. Fishing for largemouth bass on your local waters.